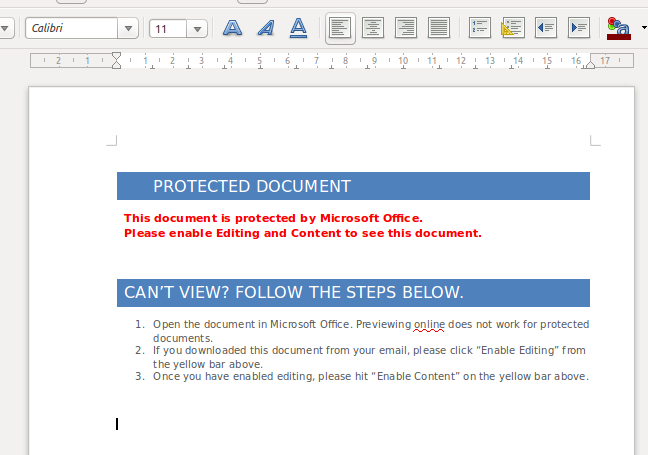 Once in a while I run across malware that drops itself via a macro embedded into a Microsoft Word DocX file, written in Visual Basic script. These payloads are fairly common and have been documented in a number of places. However, I noticed in one instance that the payload it was retrieving was encoded somehow with the macro doing the decoding. 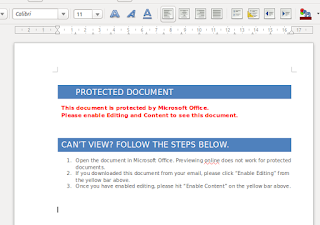 If you're not sure what the document I am referring to looks like, here's a screenshot of what you should expect if you were to open it in Word or LibreOffice. I've opted to not share the whole source code for the payload here but I am writing this as a primer for retrieving the data should you be interested in it. I've removed references to the keys and location of the payload but again this writeup should provide more than enough information. vJPIYmKkzEidc = dlBSaKVPUZeUffK + "127.0.0.1/" + "file.da" + "t"
Again, just as straightforward as earlier, we just need to combine the second argument in this function to form the key "malwarekey". Now that we've gone and figured out the payload's URL and the key, we'll want to see how the payload is decoded. It goes through two processes: the first where reorders the contents of the file and the second where it performs a XOR on each byte. Okay. So this code does in fact do something and now tells us that it's a straightforward XOR of the data. We can now just rewrite this script into Python line to line. You'll want to ignore the fact that this Python function is really a terrible mirror copy of the original, but works one-to-one like the original VBScript; there are of course better ways to write this. Now we have the file decoded and can execute it within whatever sandbox we'd like!